A long time ago, an evil spirit known as Mumm'hotep sank the land of Egypt into eternal darkness. A deadly curse was spread across the once peaceful civilisation. The Gods had to send one man to deal with this threat, the warrior of the sand... Anubis. 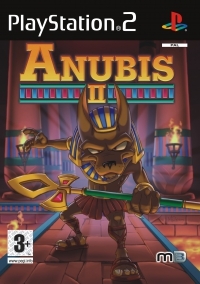 The player is armed with an arsenal consisting of the scepter of Ra and the Kanopic bombs of fury, with this, Anubis sets off to save Egypt once and for all! 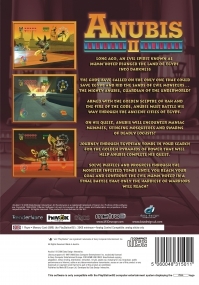 In this game, the player will have to face off with legions of evil enemies across nine playable levels of gameplay. The player controls Anubis from a third-person perspective through levels with platform puzzles and enemies that are taken out by swinging his staff or locking on to them and shooting energy balls. In each level Anubis needs to find eight pyramids that open up the portal to end the stage. Contrary to the title, this is not the sequel to an earlier game. THE MIGHtY ANUBIS, GUARDIAN tHt UNDERWORLD! WAY tHROUGH tHt ANCItNt crtrts EGYPt. HELP ANUBIS COMPLttt HIS QUtSt. respective owners. All rights reserved. This product is manufactured in the EU.
' and "PlayStation" are registered trademarks of Sony Computer Entertainment Inc.
Anubis 11 02006 Data Design Interactive. trademark or copyright work that forms part of this product are prohibited. Published by Metr03D Europe Ltd. Developed by Data Design Interactive.